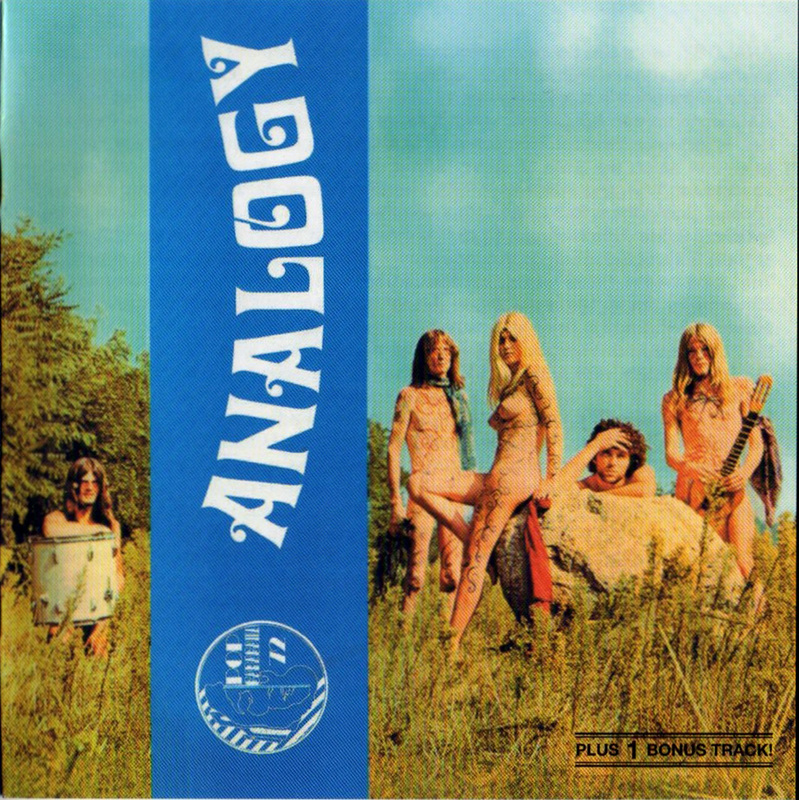 Analogy, today one of Germany’s best-known bands in the field of melodic progressive rock, formed, as such, in the spring of 1972. Martin Thurn (born 1950) had taught himself the first chords on the guitar. In early 1968 he started a band called No. Six in his hometown Bonn. After having moved, in the autumn of the same year, to Varese in northern Italy to attend an international school, he immediately formed a new band called Sons of Giove, together with a classmate and compatriot, Wolfgang Schoene (born 1950), guitar and vocals, Roger Schmitt on bass and Jean-Claude Sibel from Belgium on drums. Bass player Thomas Schmidt (later head of Pell Mell) was also a temporary member of this outfit. Jutta Nienhaus (born 1953), Martin’s girlfriend, was a permanent companion of this band of students, playing many gigs as a singer in what was called “Jutta & Martin”. Sons of Giove disbanded in late 1969 after some gigs including a show with “I Cuccioli”, but a new band, The Joice, was formed immediately afterwards in early 1970. The line-up consisted of Martin Thurn (guitar), Jutta Nienhaus (vocals), her brother Hermann-Jürgen “Mops” Nienhaus (born 1952) on drums, and the only Italian in an otherwise German band, Mauro Rattaggi (born 1952), formerly with the Riverboys, on bass. They were fortunate enough to land a management contract immediately, which lead to numerous gigs in northern Italy and southern Switzerland and enabled them to buy a proper P.A. and new instruments. In September of the same year, Wolfgang Schoene joined again on rhythm guitar. During a gig in a Milan suburb around Easter 1971, Antonio Cagnola, a businessman from Monza, who had just founded the small Dischi Produzioni 28 label, approached the band. His family owned, and still owns, the Microwatt record-printing factory in Vimercate near Monza and therefore had good connections to many Italian music businesses, including the probably largest distribution company, Messagerie Musicali (later to be taken over by CBS). In early May, the band recorded two tracks as a demo, “God’s own land” and “Hey Joe”, in a Milan studio, but the quality was so bad that nothing came of it. Shortly afterwards, Jutta recorded a single with a singer named Ice (of a band called Alta Società), which was released mainly to serve the juke-box circuit. The Joice finally signed a recording contract with Produzioni 28, which guaranteed them the freedom of determining their own music. For the moment, however, the band continued gigging almost uninterruptedly. On a beautiful summer evening on 28 June 1971, The Joice played an open-air festival near Arona (Lago Maggiore), where Toad, the Swiss band, also appeared. During a free interpretation of sequences of Pink Floyd’s “Atom heart Mother”, the keyboarder of the previous band, Nicola Pankoff (born 1948), stepped onto the stage, put his organ, which was still standing there, into operation and played along with the band. Although they had never seen each other before, the music was wonderful. That was the beginning of a very productive 14-month co-operation as he joined the band the following day, turning it into a six-piece line-up. In the same summer, they recorded two tracks written by Martin Thurn, which, especially in the lyrics, reflected the non-political spirit of the 1968 generation: “Sold out”/”God’s own land” (Produzioni Ventotto PRV 28009). It was released as a single shortly afterwards. The cover features, from left to right, Martin Thurn, Mauro Rattaggi, Wolfgang Schoene, Jutta Nienhaus, Nikola Pankoff and Hermann-Jürgen Nienhaus. A printing mistake on the cover and the poster accidentally changed the name into Yoice, and the band decided to go the easy way and keep it. Thanks to clever distribution, the single was available all over Italy and the circulation probably reached five-digit figures. A large part of this success, however, was based on so-called juke-box promotion, a phenomenon almost typical of Italy, which meant that singles were produced exclusively for the juke-box circuit, without covers, sometimes featuring works of other bands on the B-side. Experts might therefore find singles featuring “God’s own land” on one and Ihre Kinder’s “The Dice” on the other side. These juke-box promotion singles are very much sought after by collectors. At the end of 1971, Mauro Rattaggi was forced to leave the band because he had to start his compulsory military service in the Italian airforce, a very negative experience for him (and for everybody else at the time). As a result, Wolfgang Schoene switched over to bass. 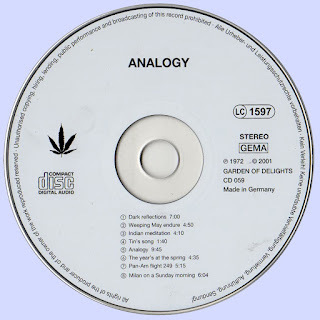 In 2001, the German label Garden-of-Delights (GOD CD059) published the first really legitimate CD of the first Analogy album on the market, again a master-tape version with a 36-page colour booklet. 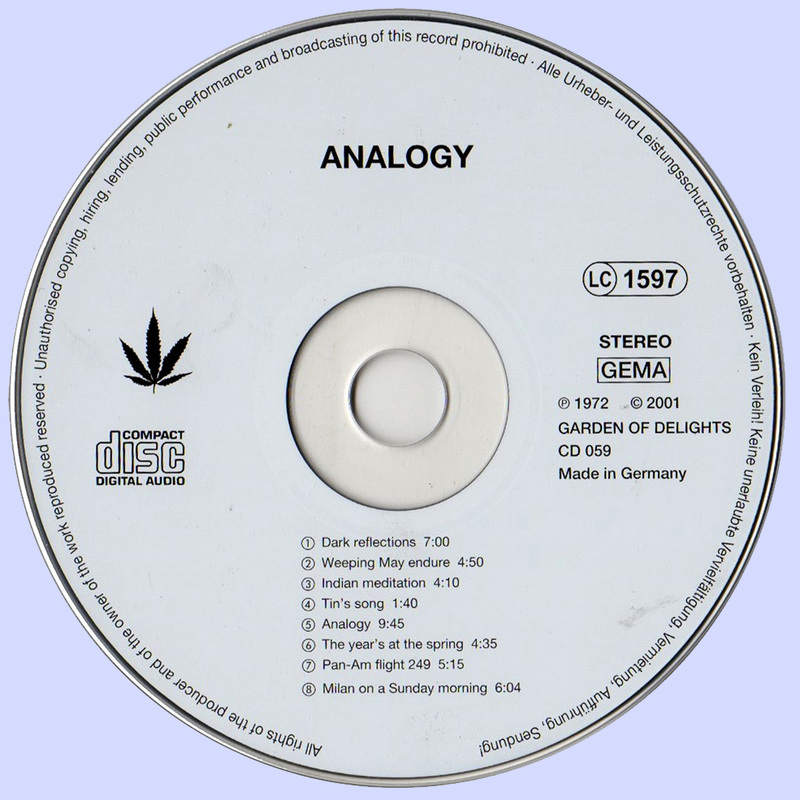 On top of that, a so-far unpublished bonus track has been added to this CD, recorded the morning after a “heavy” party, at a time when the band was in the process of dissolving. A great record, thank you Marios!